Threshold Low / High – When the noise value is above the Low threshold and below the High threshold, the dynamic range is stretched to fill 0 to 1. 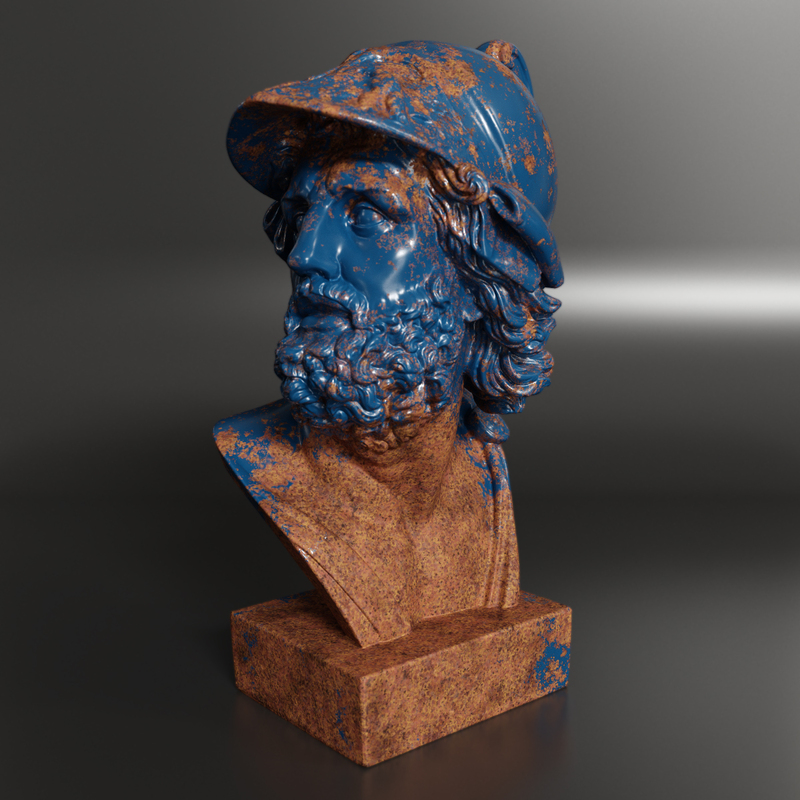 Parameters can be mapped with other texture. UVW distort – Two options: Normal, Radial. 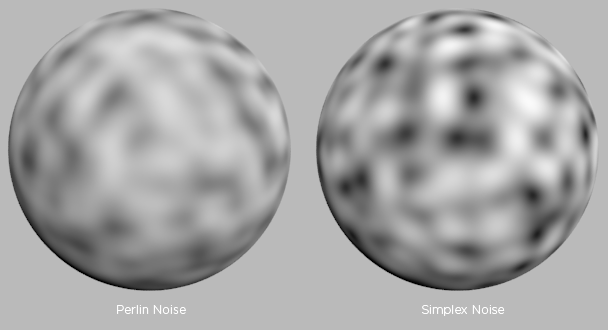 ProSimplex texmap contain two noise types: Perlin (2D, 3D, 4D) and Simplex (2D, 3D, 4D). Perlin Noise is the award winning type of gradient noise developed by Ken Perlin in 1982. Phase – offset in fourth dimension (w) – the “location” in time. Worley Noise also known as Cell Noise or occasionally Voronoi Noise – computing the distance to randomly distributed points, and weighting the lightness of the each pixel by the distance from the closest point. Distance Metric – 6 distance metric options. The means to measure distances to neighboring cells. 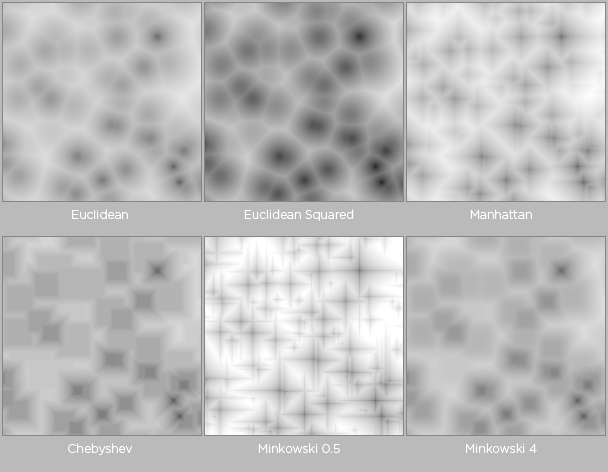 F. e., Manhattan distance gives more rectangular shapes and Euclidean distance gives more spherical shapes. Euclidean. Computes the Euclidean distance to the nearest points. It looks a bit more pointy than Euclidean Squared distance. Euclidean Squared. Computes the Euclidean Squared distance to the nearest points. It looks rounder than pure Euclidean distance. Manhattan. Inspired by the grid-like organization of Manhattan, this is distance to the nearest points when you can only travel around the cell’s boundaries. Chebyshev. Also known as the Chessboard Distance, it is somewhat similar to the Manhattan distance, but with 45 degrees rotation. Minkowski 0.5. Minkowski – a generalization of both Euclidean and Manhattan distance (Minkowski Exponent e = 0.5). Minkowski 4. (Minkowski Exponent e = 4). 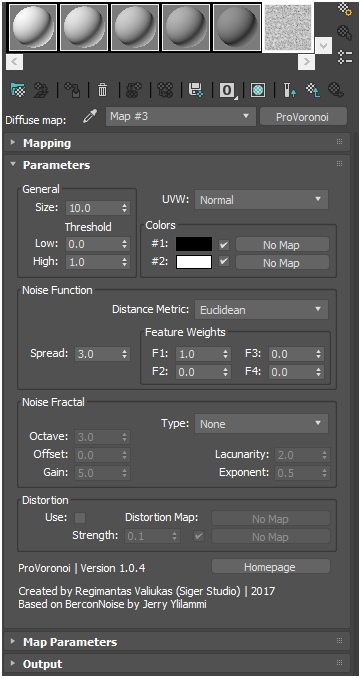 Represent the values of the four Worley constants, which are used to calculate the distances between each cell in the texture based on the Distance metric. Adjusting these values can have some interesting effects on the end result. Parameters can be mapped. Some examples. Distance Metric: Euclidean Squared. 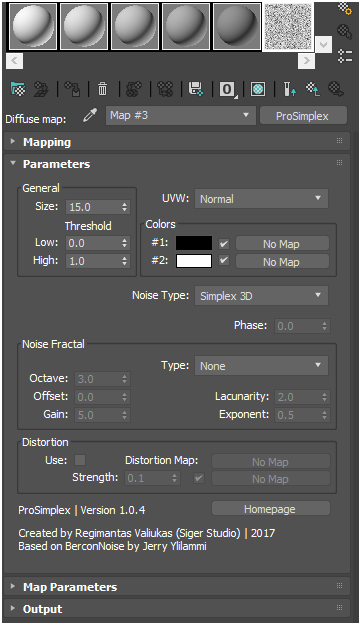 Octave – controls the number of times the original noise pattern is overlayed on itself. Gain – determines the range of values created by the function. The higher the number, the greater the range. Lacunarity – a multiplier that determines how quickly the frequency (size) increases for each successive octave in a noise function. The frequency of each successive octave is equal to the product of the previous octave’s frequency and the lacunarity value. i.e. Lacunarity = 2.0 –> Scale = 1/2 original. Exponent – the fractal increment parameter H (Hurst exponent). The higher H becomes, the more smoother the noise will be. Copy file “SigerNoise_xxxx.dlt” to 3ds Max\\plugins directory (If you have installed older version – delete the old file!). * Both map bug fixes. * ProSimplex – fixed bump function. 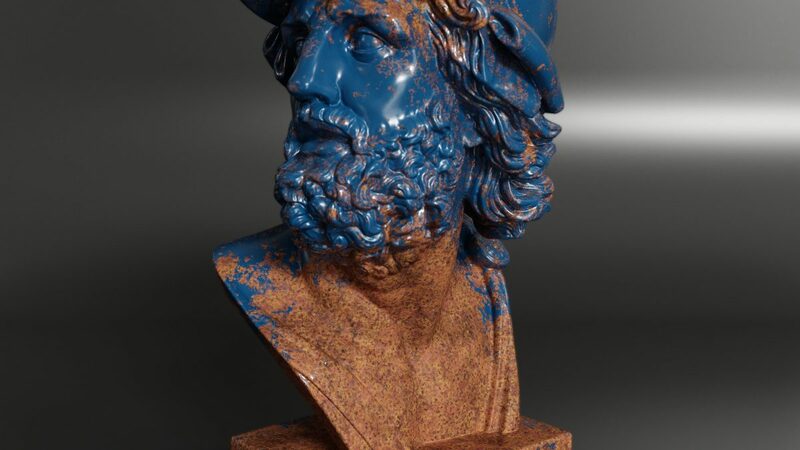 * ProSimplex – fixed 3D function scale of return values in the interval [-1,1].